Target Liberty: Police Militarization Fever in the Hamptons! Police Militarization Fever in the Hamptons! A few weeks ago, the Bridgehampton Chamber Music Festival held one of its occasional outdoor concerts at a nearby Long Island winery. It was well attended -- 400 concertgoers came to sip wine and listen to the music of Bach and Django Reinhardt -- but that wasn’t a surprise: Now in its 34th year, the music festival is one of the mainstays of the Hamptons summer season. Here’s what was surprising, according to my friend and former New York Times colleague Susan Lehman, who was there: “Driving in,” she emailed me the other day, “it was impossible not to notice two figures with the word POLICE emblazoned in white on their spruce black costumes, and very noticeable automatic weapons in their hands.” She added that while the musicians were on stage, “two armed guards milled around in the open space in the front of the tent where the concert was being held.” Afterward, when someone inquired about the presence of these heavily armed police, he was told that the Southampton 1 police department required the extra protection. Yes, it’s true, the town of Southampton, New York, with its 55,000 year-round residents -- and its deserved reputation as a summer playground for the rich and famous -- now has its very own counterterrorism squad. 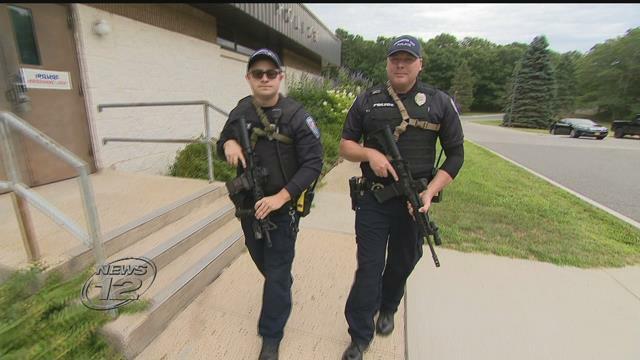 Its members were first sighted in April, when cops wearing bulletproof vests and carrying fully loaded AR-15s showed up at the Bridgehampton Half Marathon, where they spent most of their time milling around the finish line. They’ve since “protected” several dozen high-end Hamptons galas and events, including a big benefit for the Ovarian Cancer Research Fund, a fundraiser for the James Beard Foundation, the annual Hope in the Hamptons event put on by St. Jude Children’s Research Hospital, and even a family fair that took place at the Children’s Museum of the East End. The children’s museum! Less weaponry was flashed at Hillary Clinton’s Hamptons fundraisers last year than has been seen at various galas around Southampton this summer. But why? It’s not as if Southampton has ever suffered a terrorist attack. Indeed, Southampton’s police chief, Steven Skrynecki, has repeatedly told the local media that there hasn’t been so much as a hint of a threat. But with so many events attracting wealthy celebrities -- and with terrorist incidents on the rise in many Western countries -- he felt that it was necessary to increase security. “Many of the people at Southampton events are symbols of American affluence and success and capitalism,” Skrynecki told me. “At the same time, there is an abundance of freedom of expression and morals and dress. The attendees’ beliefs might be contrary to the known ideology of terrorist groups.” He also mentioned the possibility that someone on the “ultra right” could try to commit an act of terrorism at a fundraiser attended by wealthy liberals. Well, yes, I suppose something like that could happen in the Hamptons -- just as it could happen anywhere, at any time. The randomness of a bomb going off in a packed arena, a gunman killing children in a school, a truck barreling into a crowded sidewalk -- that’s the very definition of terrorism. We know that there will be terror attacks; that’s the world we live in. We just don’t know when or where. And the notion that there is a higher likelihood of an attack on a chamber music concert or a family fair than, say, an overcrowded Hamptons train depot on Labor Day weekend (which the police don’t patrol) seems a stretch, to say the least. There’s another, more plausible reason Southampton has a 15-person counterterrorism squad. Skrynecki, it would seem, has caught militarization fever, a disease that too many of his fellow police chiefs have also come down with. If the boys get their toys the boys must play with their toys.